Don’t get me wrong, the new W800BT headphones seem pretty impressive. Without a single wire, the two earbuds communicate with each other and a smartphone (or tablet or whatever) completely wirelessly. The right one even includes a microphone, so you can do hands-free calling. Meanwhile, passive noise isolation is supposed help provide top notch sound, and you can can top up the 12-hour battery life on the go with a charger case. This is all assuming, of course, that the dang things stay in your ears. The handsome disc-shaped design certainly borrows from the knobs on Onkyo’s hi-fi equipment, but based on early press shots, the earbuds look like they’re roughly the size of a short stack of poker chips. In a way, it’s a fitting analogy. High quality audio equipment and miniature-sized parts often don’t go hand-in-hand. Making premium sound wireless is also not an easy task. The intersection of these two challenges is where a number of headphone companies have been converging in the past couple of years, however—since wireless is convenient, and consumers will pay a premium for quality. 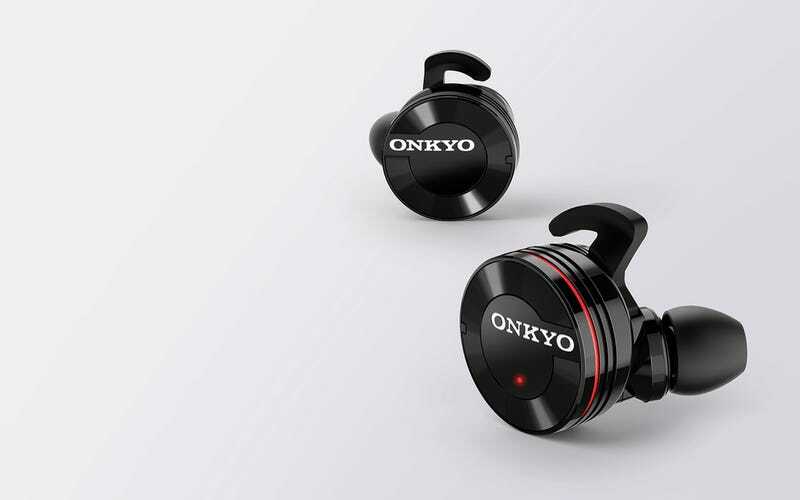 Onkyo is just the latest company to bet heavy on Bluetooth audio, and it’s pretty ballsy for it to come out with some wireless earbuds right off the bat. These are not necessarily the first truly wireless earbuds to pop up, though they might be the first you can buy in a store. (Onkyo will start selling them in Europe this November for a cool €300—that’s about $330.) Countless Kickstarter programs have promised wireless earbuds, and each project has its own quirks, though they’re all pretty focused on fit: One promises to be the smallest earbuds while another plans to provide a perfect, custom fit with the help of 3D-printing technology. Otherwise, you’ll have to settle for wireless earbuds that are connected with a dang wire or, even worse, a freaking plastic necklace with earbuds streaming out the ends. So what to do if you want your audiophile-friendly future to happen right now? Well, you can buy over-the-ear or on-ear Bluetooth headphones. Here are a bunch of great options. Otherwise, you can sit tight and wait for dreams to come true. It’s possible that Onkyo’s cracked the code and figured out how to win the wireless earbud game, but damn, those things look hilariously huge. At the end of the day that might be a good thing, as long as they stay in your ears—wireless earbuds seem stupid easy to lose.